High quality capsule-shaped halogen lamp with G4 cap and a power consumption of 20 watts. Suitable For Cooker Extractor Hood, Cabinet Lighting And Various Other Applications. Halogen capsule lamps are used in cooker hoods, display and accent light fixtures providing an extremely compact light source. 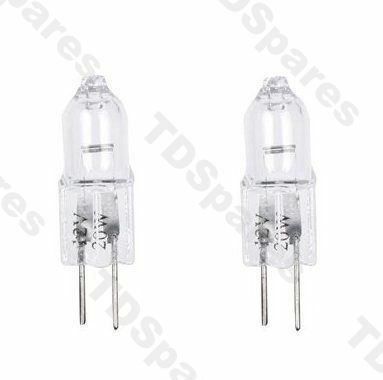 G4 5w Halogen Clear Capsule Bulb x 2, 12 Volt, 5 Watt, Average Life 2000 Hour, Suitable For Cooker Hood, Cabinet Lighting And Various Applications..